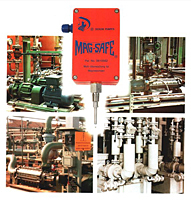 The MAG-SAFE is developed and designed for monitoring DICKOW sealless pumps and preventing serious pump failures. The MAG-SAFE system is patented, Pat.No. 0610562. The Ni-thermocouple wire is spot-welded to the containment shell surface and forms a thermocouple. Contrary to the PT100, the MAG-SAFE reads the temperature in the center of the magnets between shell and magnets direct at the heat source. Temperature changes in the thermocouple generate voltage changes. The transmitter converts these changes into a linear output signal of 4 to 20 mA. This gives the possibility to preadjust through a trip amplifier any shut-off temperature within the range of -50 to + 250°C (-60 to + 480°F). Fast and reliable detection of all temperature rises in the magnet area. Switch off in time, also at dry running and decoupled magnets. Combined with the coated SiC-bearings which can tolerate dry running until the MAG- SAFE is activated, this system offers reliable dry running protection. Since the containment shell is the real heat source because of the eddy currents generated in it, any temperature rise will be monitored before the liquid temperature is remarkably affected. Thus, flashing of liquid can be prevented through a correctly set trip temperature. Inadmissible containment shell surface temperatures in hazardous areas are prevented. The direction of the internal cooling flow has no influence on the temperature reading. Worn out ball bearings cause eccentric run of the outer magnets and will lead, if not detected, through wear at the protection device to a containment shell rupture. In this case, the MAG-SAFE will trip the motor by cutting the thermocouple wire. Leakage of pumped liquid due to containment shell failure is excluded.